Prairie dogs: fuzzy little socialites that live in elaborate burrows and chow down on grass all day, right? Seem like nice neighbors? Hate to shatter the illusion, but I’ve got some knowledge to share. Prairie dogs are cold-blooded killers. And if you’re a ground squirrel, you’re advised to move out of town immediately. For six years, Hoogland, his colleague Charles Brown, and a small army of students sat in towers at the Arapaho National Wildlife Refuge in Colorado, watching prairie dogs go about their business—foraging for food, rearing their young, and butchering ground squirrels for sport. For further proof that nature is relentlessly brutal, this behavior seems to give prairie dogs an evolutionary advantage. Hoogland’s findings, which include 163 ground squirrel kills by 47 prairie dogs, are published today in the Proceedings of the Royal Society B. 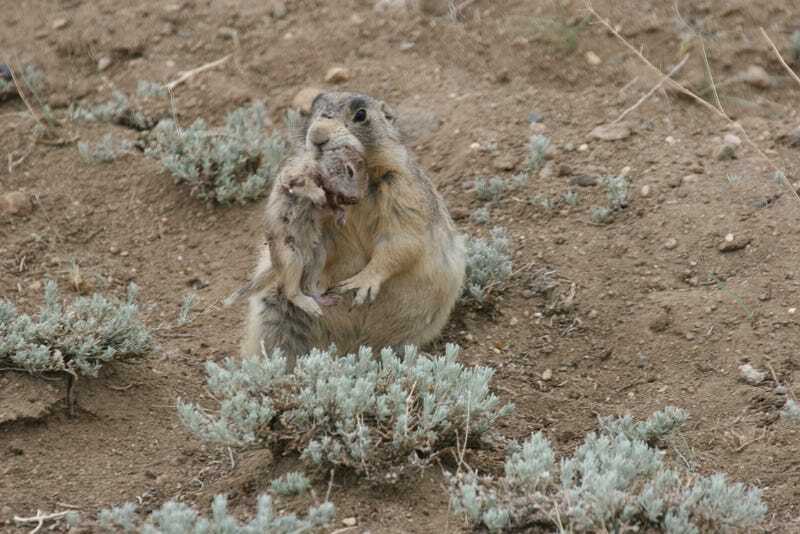 In a particularly brutal episode, Hoogland witnessed a female prairie dog murder seven baby ground squirrels in succession, shaking them to death one by one as they emerged from their burrow for the very first time. “It was quite an afternoon,” he said. It’s the first known instance of a mammalian herbivore killing another mammalian herbivore on a routine basis, and according Hoogland’s research, it’s all about competition. Prairie dogs and ground squirrels live in the same habitat and eat many of the same grasses. Fewer ground squirrels; more food for the prairie dogs and their young. The truth about prairie dogs is horrifying. But it’s possible biologists are skimming the surface of a bloody Darwinian tale that runs deep into evolutionary history. Pop culture loves to portray herbivores as peace-loving pacifists—just look at Zootopia as the latest example of this—but who can say what other barbarous acts are going undocumented in our backyards? Are rabbits stealing into burrows to throttle chipmunks in their sleep? Do elk and buffalo lose their cool and impale each other over prairie grass? These are the sorts of unsettling questions biologists will have to start asking.